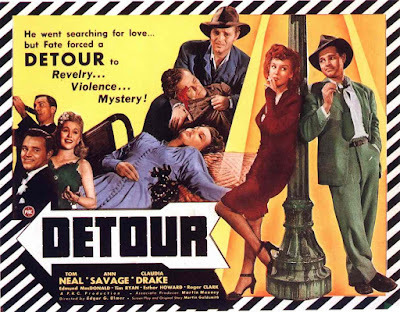 ‘The Criterion Collection’ have recently released a brand-new digitally re-mastered edition of the 68-minute film-noir classic, ‘Detour’. It was directed by Edgar G. Ulmer, it starred Tom Neal, Ann Savage, and Claudia Drake, plus, as an extra added bonus, it comes with a number of very special features. This includes a full-length documentary, a restoration featurette, an interview with Noah Isenberg, as well as the original theatrical trailer. Please enjoy. How long have I been driving now? Two days? Three days? Maybe more? Well, however long it’s been, the one thing I can say for certain is that I wish I never, ever, ever, picked up that crazy looking lady sitting right next to me! Although, to be fair, my life wasn’t always like this, because once upon a time I was happy enough to travel across country in order to meet up with my girlfriend, Sue (Claudia Drake), who managed to get herself a job in Los Angeles. Sue's a singer, you see, a very versatile singer, whereas I’m a musician that plays the piano but doesn’t have a car, much money, or any real way of getting to her, apart from hitchhiking across America in the name of love. Which I did, in fact, for quite some time! But then, one dark and stormy night, I hitched a lift from a man named Charles Haskell (Edmund MacDonald). A man, I hasten to add, that I accidentally killed while we were both traveling together. Not deliberately, mind you, as it was an accident, a terrible, terrible accident! 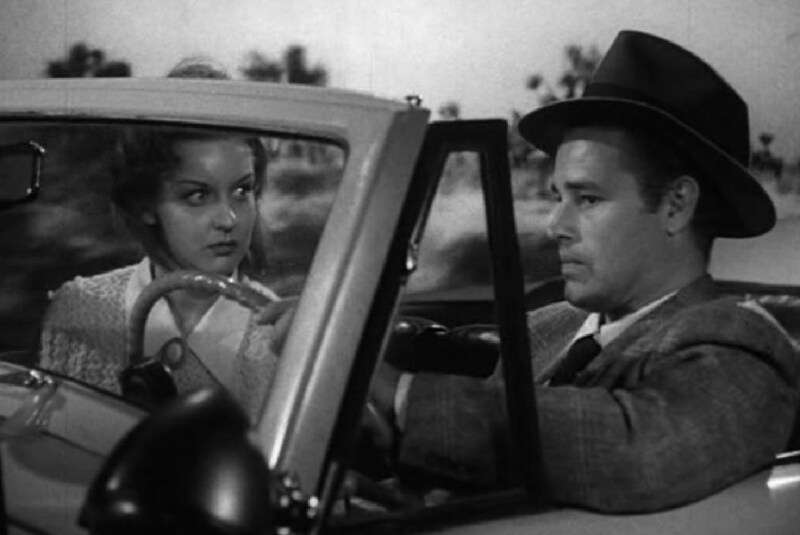 Which resulted in me dumping his body, getting behind his wheels, and continuing my journey, all alone, until I mistakenly picked up that crazy looking lady sitting right next to me: Vera (Ann Savage), who just so happens to have been a good old friend of Charlie’s. But then again, that’s most probably why what next transpires goes, zoom, zoom, zoom, all the way to hell and back. 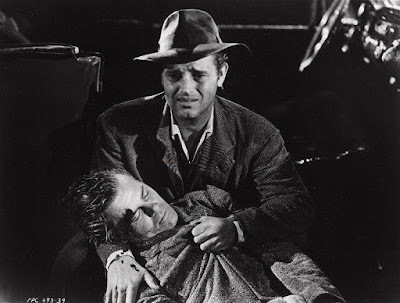 As two hitchhikers make a devilish deal - a heinous plan shows a lot of zeal - a crazy lady shies away from a telephone bill - and at the end of the day, please remember, my name is Al Roberts, and I was played by Tom Neal. Compared to today’s cinematic landscape, ‘Detour’ must seem like a very low-budget production because it has no special FX, no big name actors, and no storyline involving an earth-shattering disaster! But hey, who cares, right? Who cares if this film is as old as canned ham and is as shady as a twelve o’clock shadow? After all, what it lacks in high-tech tomfoolery, it more than makes up for in style, suspense, and a story so spiteful, I couldn’t help but feel sorry for the main protagonist by the end of it. You see, in many ways, this movie is like a three-act play, with each act adding a layer of intrigue and dread to its overall tone. Act one, for instance, was able to set the mood by painting a portrait of a disgruntled musician who’s down on his luck. Act two, on the other hand, elevated the scene slightly by showing us said-musician traveling across country in order to meet his lovely girlfriend. Act three, however, well, this act starts to make things rather, rather fruity! Meaning, from this moment onwards the main character, named Al, unintentionally digs himself further and further into despair. And trust me, folks, I do mean despair. The kind of despair that keeps on building, and building, and building, until eventually, POP!, you can easily forget all of its cosmetic flaws (such as the shoddy rear-projection and the poorly constructed sets), and just concentrate on this film's well-crafted narrative that works on a variety of different levels. On one level, it’s a character-driven piece that tells the tale of a man who can never seem to catch a decent break: Al -- As played by the sullen Tom Neal (who coincidentally killed his real-life wife many years later). On another level, it’s about a deranged woman who will stop at nothing until she gets what she wants: Vera -- As played by the amazing Ann Savage (who sadly quit acting one year after making this movie). And on yet another level, it’s a stylistic adventure that showcases atmospheric lighting, voice-over narration, and a mean spirit that’s so devilishly spiteful, by the end of it, I’m sure it will leave you with a bitter taste in your mouth. But, before I tell you what I mean by this, let us take a quick break by checking out the following filmic facts: (1) 'PRC' first screened this production in America on the exact same day Knud Kristensen became Prime Minister of Denmark. It was on the 7th of November, 1945. (2) This movie was based on a novel written by Martin Goldsmith in 1939. Martin is generally known for writing a few stories for the popular television series, 'The Twilight Zone' (3) Loosely translated, this project was entitled 'The Curve of Destiny' in Brazil; 'Diversion' in Germany; and 'Fateful Encounter' in Greece. (4) One of the main taglines used to promote this picture, states: 'He went searching for love, but Fate forced a DETOUR to Revelry... Violence... Mystery!'. 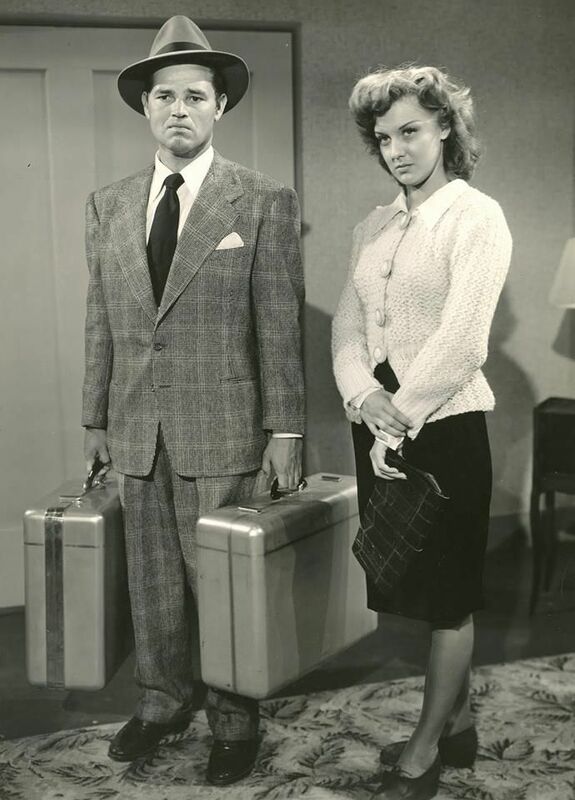 (5) Ann Savage once said that she didn't get along with her co-star Tom Neal during filming. Heck, on one occasion, she even slapped Tom in the face because he put his tongue down her ear. (6) Depending on who you listen to, this production either cost thirty thousand dollars to make or one hundred thousand dollars. And along similar lines, it either took one week to make or twenty-seven days. (7) In 1992, this became the first 'b-movie' that 'The Library of Congress' chose to store in their 'National Film Registry'. 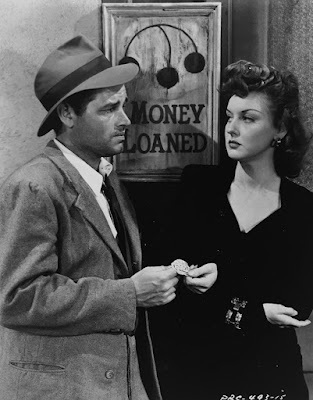 (8) After this movie caught a cold, Tom Neal starred in the murder-mystery, 'Club Havana'; Ann Savage starred in the crime-thriller, 'The Spider'; and Claudia Drake starred in the adventure, 'The Crimson Canary'. Okay. So where was I? Oh yes! I remember now. I was going to tell you why ‘Detour’ will leave you with a bitter taste in your mouth! Well, with all due respect, this is the type of film that isn’t afraid to show you the darker side of life. The side that many of us try to shy away from because it involves bad, mad, and crazy people doing outlandish things in the name of self-preservation and greed. What’s more, it’s also an ambiguous movie, a very ambiguous movie, largely due to the plot refusing to divulge too many details about certain characters or events. Most notably, if Neal accidentally killed Charlie or if he did it himself while popping pills, along with the fact that it’s never quite clear who Vera is as a person. I mean, was she an escaped lunatic? A disgruntled ex-girlfriend? Or a mixture of the two looking for the next quick fix? Also, how long did she know Charlie, and do you think it's possible for her to bump into Neal intentionally? Which, let’s face it, is the only part of the movie that seems slightly coincidental. Come to think of it, something else about this movie which seems slightly coincidental, preordained even, was how its structure was easily split into two distinct halves: With the first half centered on how Al got himself into this mess, whereas the second half is centered on Vera blackmailing Al into cooperating with her fraudulent schemes. Although, on second thoughts, this is a b-movie, and as some of us know, most b-movies were structured in this fashion so the theatres could cut them in half, insert an intermission in the middle, and use this time to sell their poultry wares, such as popcorn, drinks, hot dogs, and that sort of thing. Out of curiosity, do you enjoy consuming popcorn, drinks, hot dogs, and that sort of thing? If so, then I would suggest you grab whatever you can and have a quick munch while watching 'Detour'! As it's one hell of an amazing film, which I’d highly recommend if you love film-noir, captivating thrillers, plus evil looking women and downtrodden musicians!